Developers often argue about how to insulate walls, which is better than mineral wool, or foam? Someone thinks that EPS (extruded polystyrene foam) will be the best option for thermal insulation of the house, someone does not. In principle, the thermal conductivity of each of these heat insulators are very close. But their other parameters are too different, so let's deal with everything in order. Attention! The term mineral wool implies several types of insulation, see the material in more detail: Technical characteristics of mineral wool, its brands and selection criteria. In this article we will talk about the mineral basalt wool, because as soon as its properties can be compared with foam and make a choice. All other types of mineral wool will lose as basalt wool and polystyrene foam. The vapor permeability coefficient of both conventional and extruded polystyrene foam is 0.03 mg / (m · h · Pa). In mineral wool, this figure is 10 times more. This means that the ability to pass evaporated water from her is better. Although in practice, wall insulation consists of several layers with different vapor permeability. The total vapor permeability will correspond to the characteristics of the material for which it is minimal. Therefore, different types of insulation close to each other. If the insulation system has a polymer structure, then mineral wool is not worth using. 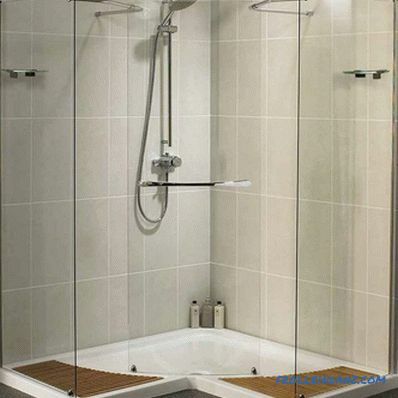 The fact is that both the base of the system and the outer layer, made of polymer, do not allow moisture to pass through. If the condensate gets inside, soaking the layer of mineral wool, the water will not be able to evaporate, and the insulation will lose its insulating properties. After all, if you do not even wet the cotton, it will become bad to keep warm. Therefore, when warming a house, one should be guided by the rule: good vapor barrier should be made from the side of the house, and material with a greater vapor barrier should be laid closer to the outer walls. So excess moisture will go out into the street. Polyfoam does not pass vapor, but does not accumulate either. 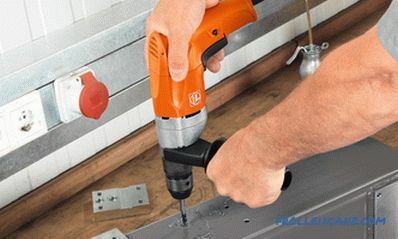 Steam penetrating from the side of the room is usually removed through the joints and irregularities of the insulation. This property can be both a plus and a minus, so here, as they say, a draw. Here mineral wool has a clear advantage - after all, this material does not burn at all. Note that some types of basalt cotton wool are able to withstand ambient temperatures of up to 1000 degrees. Celsius Styrofoam is not only easy to melt, but also able to burn on their own. Some may argue that flame retardants are added to the polystyrene foam to prevent burning. Yes, they are quite rightly added, but only their action eventually fades away and the foam begins to support burning. And here is the video clearly demonstrating what happens when burning extruded polystyrene foam, basalt wool, foam plastic, polyurethane foam and ecowool. In this parameter, both heaters are approximately equal. The cost and mineral wool of basalt rocks, and foam varies depending on their density. Influences on this indicator and brand. 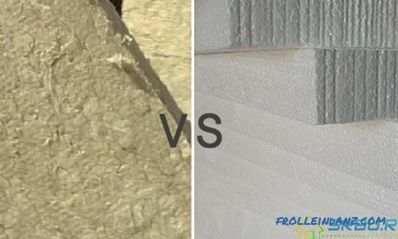 Styrofoam (both conventional and extruded) is more durable and resilient than mineral wool. It is easy to cut and grind. However, it is quite problematic to glue this insulation so that at the junctions of individual elements to avoid the appearance of cold bridges. This problem is solved by using foam sheets with a L-shaped edge. Mineral wool is able to be dense and elastic only in mats laid in the frame and on the facade. But the joints of its sheets are so small that there can be no talk of cold bridges. As already mentioned, manufacturers indicate almost identical values ​​of thermal conductivity coefficients for mineral wool and foam plastic. Empirically, we managed to find out that polystyrene foam with insulation still gives the best results. The fact is that only very dense basalt wool, produced in the form of plates, has the same thermal conductivity. But the rolled material, which after rolling becomes looser, is inferior to expanded polystyrene by its insulating properties. After all, the PPP inside is a set of closed cells with air. This structure allows the material to retain heat very well. But the mineral wool warm air releases outside - because it does not have isolated cells.The air layers as a result of convection move from the warm side of the insulator to the cold (outer) side. And the room warmed by mineral wool as a result is cooled faster than that which is warmed by polystyrene foam. Any foam, even the most inexpensive, as a heat insulator works better than mineral wool. After all, all manufacturers of refrigeration equipment and water heaters choose it for insulation. If these heaters are used together (in multilayer insulation), then outside should not be polystyrene foam. Otherwise, the requirement of increasing vapor permeability from the inside to the outside of the walls will not be met. In order to meet this condition, mineral wool should be the outer layer. It seems that the answer to the question is now clear: what is warmer - foam or mineral wool. Polystyrene used to be made of styrene, and freon was used in the production process. Such material was not suitable for use inside homes, as it released harmful gases. But now to the environmental friendliness of materials more stringent requirements. Both European and Russian manufacturers have ceased to use freon for the manufacture of foam. Therefore, for outdoor work, it is absolutely safe, in any quantities, but indoors it should be used carefully - not very carried away by the amount. You can often hear or read that after 8 or 10 years the foam begins to break down. But this happens only if the material has no protective coating. And then rain, snow and the sun's rays (in particular) can really damage the foam. But after all, in thermal insulation systems, PPP usually has a decorative coating on top. And the moisture resulting from the condensate settling out comes out of it by moisture transfer. In the old refrigerators foam and for 30 years, nothing has happened. And the German houses, they are insulated, are 35 years old (Polish - 20 years, Baltic - 15 years). We will keep this in mind when deciding what to choose - expanded polystyrene or mineral wool. As for basalt cotton wool, its fibers are made of volcanic rocks, therefore they are not afraid of various aggressive media, this naturally affects the long life of this material. In addition to conventional foam plastic, there is extruded polystyrene foam, which is superior in characteristics to both simple foam and mineral wool. EPPS inside has the same cells, evenly spaced. It can be used not only for warming the floor, walls and roofs, but also for the construction of various buildings and structures, as well as roads. Extruded polystyrene foam is used not only in the construction of private houses, but also on an industrial scale. The material showed itself very well, in those places where the air humidity is high enough, but it is necessary to make insulation. Polyfoam will do nothing when it comes into contact with wet ground, so they can perfectly insulate foundations, as well as various engineering structures that are underground. Dozens of years will pass, and the insulation will remain the same as at the very beginning. 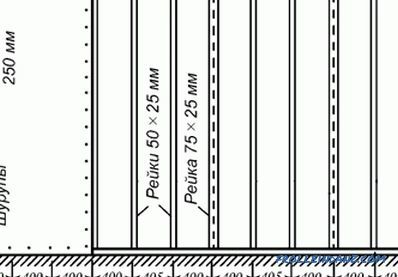 It is often used in the construction of multi-layer foundations as a middle layer. It turns out very reliable and high-quality foundation. It is also convenient to use polystyrene foam when building houses without basements, on a monolithic foundation. Slabs of this material are placed on the leveled area, and then a layer of concrete is poured on top of them. The plates themselves can be either one row or several. After the concrete has set, they begin to erect the walls of the house. To keep the foundation of the house freezing, it is very effective to insulate with foam plastic not only the vertical, but also its horizontal part. Polystyrene plates are placed along the foundation. Then they fall asleep, if necessary, additionally paving the waterproofing layer. This method of insulation reliably protects the foundation from frost. The walls of the houses (both inside and outside) can also be effectively insulated with polystyrene foam. Best of all, if these walls are block or brick. High heat insulating effect is achieved when using polystyrene foam to isolate the interior while the formation of a dew point is not observed. For the non-ventilated type of roofs (warm, flat roofs), the grade of expanded polystyrene PSBS is used. Top necessarily put a waterproofing layer. For cold roofs that are ventilated, the insulation is carried out differently. 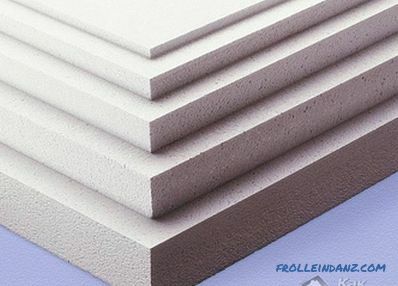 Polyfoam isolates the inside of the roof, always leaving space for ventilation. This prevents water vapor from condensing. Floors and floors between floors are also well insulated with foam boards. Under them put a layer of insulating material, and on top they are poured concrete. 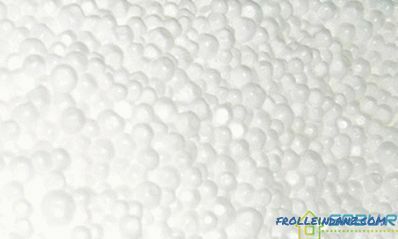 Still from expanded polystyrene they produce a variety of packaging, and also apply it to thermal insulation of refrigerators, freezers and special isothermal vans. 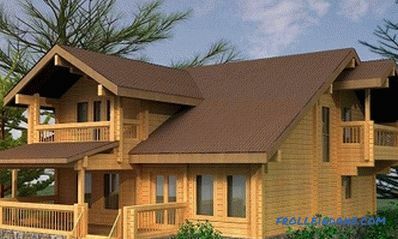 For wooden houses, you do not have to choose which is better - expanded polystyrene or mineral wool. "Breathing" walls of wood can not be insulated with foam - it will negate their useful properties. Therefore, they are warmed with mineral wool. And in buildings constructed of other materials, mineral wool sheathed partitions, floors, ceilings, floors. If they insulate external walls, they make a suspended type of ventilated facade. Vapor barrier membranes are an integral part of this design. Minvatoy is being insulated by attics, attic rooms and floors of houses, pitched roofs. At the same time be sure to leave space for ventilation. Brick houses with a small number of floors, in which mineral wool is the middle layer of insulation. It is used for three-layer panels of concrete, reinforced concrete, as well as sandwich panels in a metal sheath. Applied in those places where it is necessary to provide good protection against very hot objects, since basalt wool can withstand temperatures up to 1000 ° C.
Frame structures of any type, it is better to warm with mineral wool. In addition, it is used for noise insulation. Moreover, this material is well suited for horizontal, and for vertical, and for curved surfaces. Wool from mineral fibers, released in the form of soft plates, can be wrapped with heat, water and gas pipes. She also isolates industrial equipment in enterprises.